Dimensions 2.13" x 2.2" x 0.35"
Sample songs provided by spinrecords.com and The Salt Brothers. This is definitely one feature filled MP3 player. 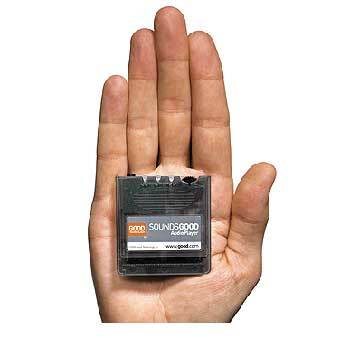 You get 64 MB of CD quality audio at your finger tips. The $149 price tag isn't bad at all considering the SoundsGood originally went for over $250. The other MP3 player for the Visor, the 64 MB MiniJam from InnoGear goes for $269. Then again the memory on the MiniJam is upgradeable, but even then the SoundsGood is still a great value. The software that comes with the SoundsGood makes transferring files from your PC (sorry no Mac support) to the player fast and simple. 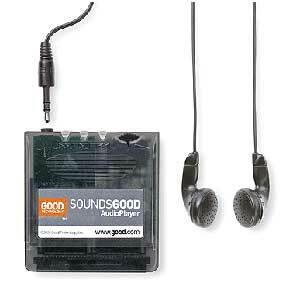 The SoundsGood software is also upgradeable so you won't have to worry about it being left in the dust. It has its own processor to process MP3 files so the Visor isn't bogged down on that. This also enables it to be a standalone portable MP3 player using the EnergyClip accessory. Features say a lot about a product but they don't tell the whole story. Let's see how good the SoundsGood audio player actually is. The software that came with the SoundsGood includes the built in audio player, the Good Desktop, the MusicMatch Jukebox, and some free MP3 songs. The build in audio player has on screen controls to select tracks, forward through tracks, change the play mode, change the treble and bass, and display information on the current track. The lay out is easy to use so you won't be stumbling around looking for something. The Good Desktop is how you transfer files from your PC to the SoundsGood. You can import MusicMatch play lists or individual MP3 files to the player. The files that are currently on the player are displayed as well as the files you want to add. The total memory being used is also displayed as well as the time it will take to transfer the new stuff to the player. The changes you make don't take effect until you hit the "Move It" button. In addition, you can also export MusicMatch play lists so you can quickly get that blend of music you created without having to open MusicMatch. The Good Desktop also allows you to search your PC for MP3 files. MusicMatch itself is a decent audio player. Personally, I prefer Winamp and I just use MusicMatch for my portable devices. 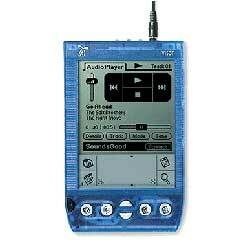 It has all the features you'd expect from an audio player and more. You can record audio CDs using MusicMatch from play lists you make. There is also support for plug-ins for various portable MP3 players to send files to the device. Unfortunately, a plug in is not available for the SoundsGood but you can open up the Good Desktop from MusicMatch. One nice thing that the plug ins allowed is the automatic setting of the bit rate, so you can lower the quality and fit more songs into the player. Since the SoundsGood doesn't have a plug in, you have to do that manually before hand and then transfer the files to the player using the Good Desktop. Not as convenient but you can still do it. That's about it for the software side of things. 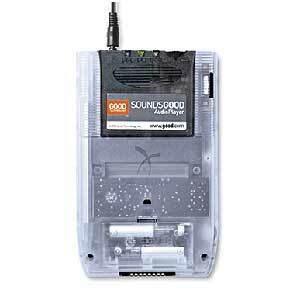 Well in terms of an MP3 player, the SoundsGood definitely performs on par with other stand-alone players out there like the RIO 500 or the Soulmate MP3 player. Not to sound silly but the SoundsGood really sounds good... In terms of battery life, the specs say around 10 hours of continuous listening which seems about right. With the Visor in sleep mode, I listened to songs all night and still had over 20% battery power left in the morning. 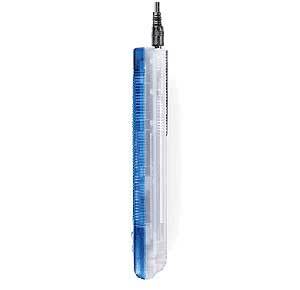 It's very power efficient, which is good since you're draining Visor batteries as you go. The external play button has an LED in it that lights up when a song is playing. Although the LED probably doesn't drain that much power, you can still shut it off or make it brighter if you want through the software. The included player software does a pretty good job. You can fast forward through songs that are playing, or search through the tracks on the SoundsGood. Transferring songs to the player is very fast, but Mac users won't be happy because there is no Mac support at all. 64 MB takes about 4 minutes to transfer over. You also need to have a USB connection to do it, which probably isn't so much a problem. Most everyone probably has a USB connection by now, and if they don't then it's time to upgrade. So now that you have an MP3 player on your Visor, where would you use it? Well, it's convenient if you're traveling and just want to listen to your favorite songs. If you're going camping or just on vacation somewhere without your computer, it would be nice if you can listen to music if you want to. You can pretty much use the player anywhere you can think of. Personally, I use it in class sometimes. I'm not saying this is a good thing to do, but since I bring my Visor to class anyway and I get bored, listening to music is better than falling asleep... ;) You can probably even try to get away with bringing it to a board meeting or some other boring get together. If you had a carrying case or belt clip, you can take your Visor with you when you go running or biking to listen to songs. You can even use your Visor to track your progress or just log your exercise activities if you don't already. The applications are only limited to your imagination. Not only can you play MP3s where ever you want to but you can also play games or do work on the Visor at the same time. However, if you're an active person, carrying the Visor around runs the risk of dropping it or damaging it in some way. Is there a way to just use the SoundsGood by itself without needing the Visor? Actually there is... With the addition of the EnergyClip accessory, you can take your music where ever you go without having to bring the Visor along. This little battery pack basically turns the SoundsGood into a stand-alone MP3 player. You still have to use the Visor to load songs on the SoundsGood, but at least you can opt not to bring the Visor along. I mean there will be situations where you really don't want to bring your Visor along or you'd rather be carrying something smaller. You get about 6 hours of continuous listening time from 1 AA battery. The EnergyClip not only make the SoundsGood really portable but also has a belt clip to keep it with you while you run or work-out. So as you can see, the blending of MP3 player and PDA is pretty cool. The SoundsGood audio player from Good Technology definitely pulls it off with flying colors. You get a first rate MP3 player with 64 MB of memory in a very neat and slim package for a fairly low price. The installation is fast and the software is easy to use. The SoundsGood is also surprisingly battery efficient. Even though the memory can't be upgraded, the player is still a good value. Visor owners who don't have a portable MP3 player yet should really check this out. It adds another element to your Visor that's only possible through the Springboard modules. You can even use it by itself with the EnergyClip accessory. I'd like to thank Good Technology for providing us with a review unit. I have to say that this Springboard module is one of the coolest I've reviewed so far. I hope you enjoyed the review.